EmuCasino is an online casino including mobile and live dealer games, established in 2012 using games powered by multiple software providers. It is operated by Seasons Ever Ltd and is licensed under the jurisdiction of Curacao. limited selection of Mobile games. No customer service phone numbers. EmuCasino is an Australian based casino launched in 2012. The casino grew to its reputation among its players especially Australians. The casino has a wide variety of games and is known for its casino races incentives, Loyalty points, and redemption shops. This includes various promotions and bonus offers. The highest numbers of players on this site are from Australia, New Zealand, Netherlands, Sweden, Norway, Finland, Canada, and Denmark with Japan coming soon. Players from these countries also receive 12 free spins as no deposit bonus. The site is available in English and Swedish with Thai on the way. The casino is operated under the laws of Curacao. Free Spins – 12 free spins from certain countries on Dragon King. EmuCasino has more than 1000 titles under its services. The games are filled with exciting themes and features. With such a variety, players will have difficulty finding their favorites so the site also provides a search option with extensive filters. 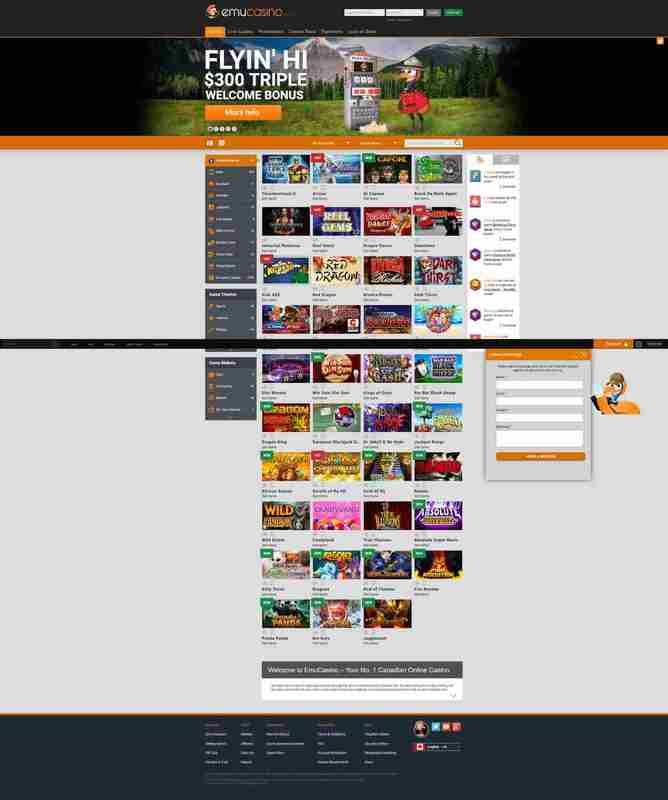 The site has a great range of games with almost 850 slot games. They have the classic 3-reels like Jackpot 3×3 as well as some trendy 5-reel slots like Wild Chase or Dragon Kings. 3D slots are also available which include some popularity like Black Gold, Boomanji, and the Heist. Some games have free spins, scatter reel, and wild reels and range from 1-8 slot lines to 31+ lines. The games are topped with casino bonuses and promotion for more excitement. Along with slots, players will find some extra sections like Scratch Cards, and Virtual Sports. Other games include Sic-Bo, Bonus Bingo, Craps, Jackpot Keno, and Pai Gow Poker. Players should also expect new games from the providers. Some recent games added to the collection include Luck Leprechaun and Al Capone. The live dealer casino features 8 live titles which include Blackjack, Baccarat, Roulette, and variations or Poker. The dealers are friendly and the games offer a life-like casino experience. Poker variations include Caribbean Poker, Three Card Poker, and Texas Hold’em Poker. Emu casino houses several variants of table games as well. Blackjack includes Multi-Hand Premier Blackjack Gold, Super Fun 21, Spanish 21, and Vegas Strip Blackjack. The roulette also has a nice collection which includes classics like American, European, and French Roulette. Video Poker has the most variety. The site offers poker in both single-hand and multi-hand denominations. These include Deuces Wild, Jacks or Better, and Bonus Poker. Emu Games which are available on mobile devices have a small mobile icon in their thumbnails. Since almost all the providers make their games mobile friendly, most of the games on the site are available on mobile. These games are optimized and adjusted for each device. They can also be accessed on any web browser without the need to download an app. Players can access live chat on the site throughout the day every week. They can get a detailed reply by professional staff almost instantly. This depends on the traffic on site, as sometimes it takes a little longer to get a reply. The staff on the support is well-trained and will try to provide the best solution for players’ problems. Customers can also contact support through a phone call. An email is also an option. Those who want to address their queries in detail can use this method. They can expect a detailed reply in at least 2 business days. The FAQ section is also available for customers’ ease. It provides all the answers to common queries regarding payment, accounts, restriction, and games etc. The security system for Emu Casino is provided by Thawte Security, a company known for its services in the online business. The site is protected using the popular and latest 256-bit SSL Encryption technology. This encryption hides every customer’s information using encoded messages when logged in. This makes it impossible for anyone other than the site and customer to read these messages. Players can see the Thawte security logo on the site an click on it for further details about the security. Providers like Microgaming are routinely tested for fair gaming by authorities like eCogra. The casino provides all this information on the site and also features monthly auditing by such agencies.